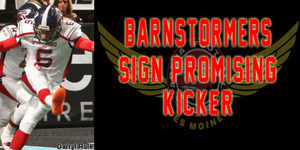 DES MOINES, IA - The Iowa Barnstormers continue to prepare for the upcoming season as Head Coach and Director of Football Operations Mike Hohensee announced the signing of K Jose Martinez. The agreement states a one year contract for the 2014 season. Martinez (5'11, 215) will play his first season with the Iowa Barnstormers, and his third season in the Arena Football League. Formerly of the Chicago Rush, Martinez made his mark on the 2013 AFL season for his accuracy in PATs. Concluding the season, he was ranked second with 90.2% accuracy in PATs after converting 119-of-132 for Chicago. In his rookie season, Martinez displayed his talent for the Milwaukee Mustangs, kicking 56-of-64 extra points and 20-of-27 field goal attempts.